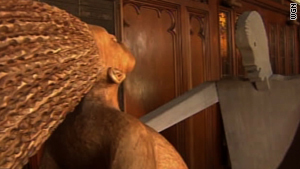 A newly unveiled sculpture at Chicago's St. Sabina Church commemorates slain children. Says one grieving woman: "I don't even get to hear anybody say 'Mama' anymore." (CNN) -- For one group of women in Chicago on Sunday, Mother's Day was marked not with flowers, but with a stark reminder of their loss. One by one, they filed toward a newly unveiled sculpture at the city's St. Sabina Church, placing small white cards emblazoned with names such as Blair Holt and Matthew Michael Rodriguez at the foot of the two figures in the sculpture. For some of the women, the realistic work of a faceless, gun-wielding assailant killing a young girl was too much to bear, CNN affiliate WGN reported. Instead of being celebrated by their children this holiday, these mothers were mourning the deaths of their children -- all victims of gun violence on Chicago's streets. "Today, as I woke up, instead of what a lot of mothers get, which are flowers or Happy Mom's Day or a kiss, I didn't get any of that," said Maria Ramirez, whose son, Matthew, was killed at 16. "I don't even get to hear anybody say 'Mama' anymore. I'll never hear that again." The sculpture's artist, J.S. Kenar, said he was trying to "show the pain, to show that something unhuman is going on here." The city has been plagued by bloodshed on its streets this year, including a particularly deadly stretch last month in which seven people were killed and 18 wounded in a 12-hour period. Statistics released Sunday by Chicago police show that while the overall violent crime rate has decreased by 11 percent this year, the city's homicide rate has risen 8 percent. As of Saturday, 127 killings have been recorded this year -- three more homicides than the 2008 yearly total. "We cannot ignore the destructive nature of guns, and how their presence can escalate a volatile situation into a tragic one," police Superintendent Jody Weis said in a statement announcing the statistics. Annette Holt knows firsthand how destructive gun violence can be to a family. Her son, Blair, an honor student at Chicago's Percy L. Julian high school, was shot on a city bus in 2007. He was killed in a hail of gang bullets when he jumped into the line of fire to save the life of a teenage girl. He was 16. At Sunday's unveiling, Holt implored other mothers to do all they can to stop the cycle of violence. "Do something to make a difference now before you're like us (and) your child is either in the cemetery for Mother's Day or birthdays, or your child is in jail for 100 years," she said.